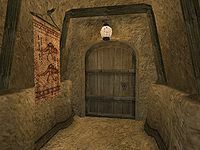 The St. Olms Brewers and Fishmongers Hall is a small liquor store located in the upstairs southwestern corner of the St. Olms canton's Waistworks in Vivec. It is accessed via two doors in the western and southwestern halls of the waistworks. The shop's proprietor, Moroni Uvelas, can be found behind the counter in the northeastern area. On top of the counter is a bottle of sujamma, a locked small chest containing 25 gold, and a draggle-tail plant. There is an assortment of alcoholic beverages on the shelves behind the counter (six bottles of Cyrodiilic brandy, three bottles of greef, six bottles of sujamma, and eight bottles of mazte) that are all available for sale. The storage room, behind a locked wooden door, is in the northwestern corner of the store and contains several barrels and cloth sacks holding random cheap ingredients and drinks that are sold by Moroni. The Short Unhappy Life of Danar Uvelas: Find a missing husband for a lady in the Brewers Hall. This page was last modified on 8 September 2018, at 04:09.